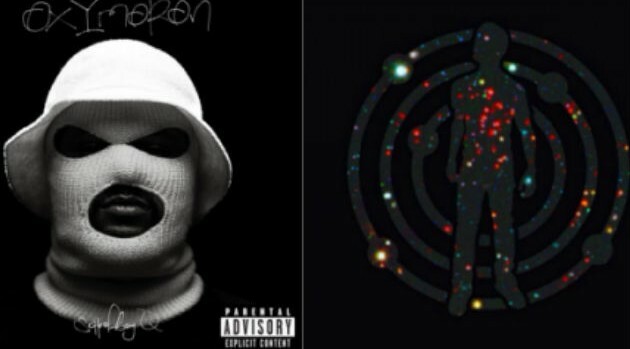 Interscope Records; Republic RecordsNext week will potentially see a strong sales start for two new rap projects: ScHoolboy Q‘s debut album Oxymoron and Kid Cudi‘s surprise new album Satellite Flight. According to Hits Daily Double, ScHoolboy Q’s first studio effort is projected to sell approximately150,000 to 160,000 copies in the first week. Industry forecasters also suggest the disc will debut atop the Billboard 200 chart, which would surpass the success of his TDE label-mate, Kendrick Lamar, whose Good Kid, M.A.A.D City debuted at number two on the chart back in 2012. Although, Kendrick’s disc sold significantly more, 242,000 copies in its first week. Meanwhile, Cudi’s surprise digital album is expected to amass between 90,000 to 95,000 sales in it’s opening week. The rapper’s previous set, 2013’s Indicud, debuted at #2 in the U.S. with sales of 140,000 copies. The official sales tally will be available on Wednesday.